Established in 1993, TOPSDISK is a professional manufacturer specializing in making NC tilting rotary tables, faceplate tailstocks, pneumatic index tables and so on products. In NC tilting rotary table series, TOPSDISK currently provides TTD-125P, TTD-255H, and TTD-255HB model. These tilting rotary tables can be divided into two types: Pneumatic Clamping and Hydraulic Clamping. Can do tilting angle machining. The feature of wear resistant alloy Dual-Lead Worm Gear is high mechanical efficiency of Power transmission, high indexing accuracy and easy adjusted on the backlash. Driven by the Servo Motor. Efficiently in position, high accuracy, low noise and suitable for any angles working piece. It can be connected with CNC machine as a 5th Axis (5th Axis or 4+1Axis). 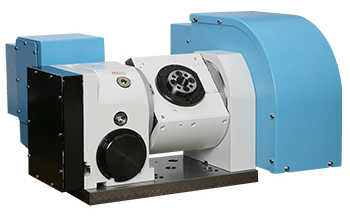 It can be connected with single axis controller to connect with CNC machine to perform tilting angel machining (4+1 Axis). Would you want to obtain further details about NC tilting rotary table series? Welcome to visit TOPSDISK’s website, you can find various machine tools on our website. Feel free to contact us or send inquiry to us!